Surface runoff is a natural process and occurs from rain or snowmelt that flows over the land surface and moves into surface water bodies. This runoff water has the potential to pick up and transport soil and nutrients from the land into water bodies. Limiting the amount of surface runoff can be a good conservation practice when trying to protect water resources. Will an emphasis on soil health reduce surface runoff? Recently, there has been an increased emphasis on soil health and its benefits for production and water quality. Healthy soils are more than just fertile soils with adequate nutrient levels, they also have high soil quality including physical structure and biology. Plant diversity, minimal soil disturbance, and substantial vegetative and soil cover all contribute to improved soil structure. The key principles of soil health are sound and have the potential to increase infiltration and water holding capacity as soil organic matter levels increase. 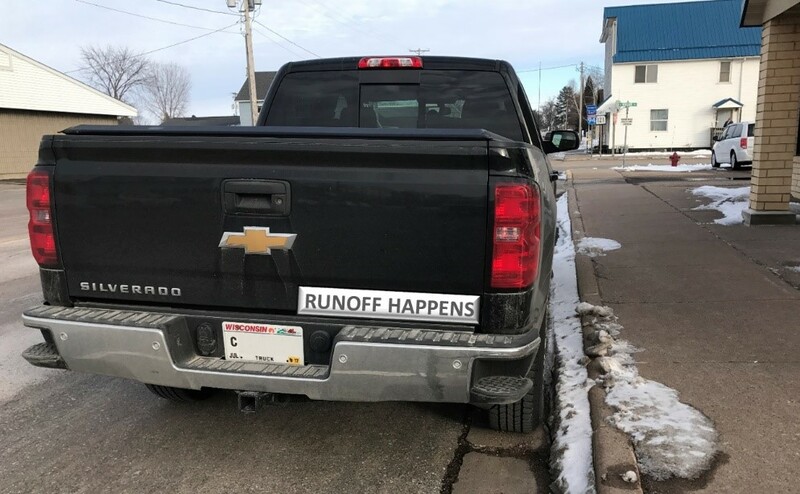 The problem is that increased infiltration does not always equal reduced runoff, and there is no silver bullet solution to surface runoff challenges in Minnesota and Wisconsin. Runoff happens…but when and how? Discovery Farms in Wisconsin and Minnesota have collected edge-of-field surface runoff data on 19 different farms and 27 different fields, resulting in over 120 site years of data since 2002. Through all the different landscapes, climate variables, and farming systems monitored, there has only been one year where zero runoff was recorded at a Discovery Farm monitoring site. Runoff happens. Surface runoff in Minnesota and Wisconsin is mainly due to frozen soil or snowmelt runoff. On average, soils are frozen at Discovery Farms sites for 112 days a year, from about the beginning of December to the end of March. Across all Discovery Farms sites, 54% of annual runoff occurred with frozen soils or snowmelt conditions. During frozen soil conditions, there is little difference in infiltration rates between two different soils or two different soil health levels. No matter the soil cover or organic matter level, every site monitored by Discovery Farms has always been frozen for some period between December and March. Infiltration rates have little impact runoff behavior during this period. 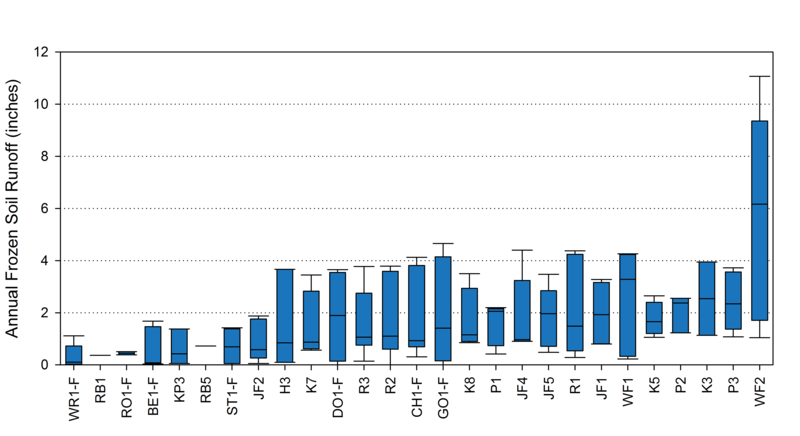 Although site WF2 is trending higher, there is no significant statistical difference in annual frozen soil runoff between any of the Discovery Farms sites monitored (Figure 1; p-value 0.172). There are major differences in soil health-related management practices between these sites. Some sites have intensive tillage, some utilize no-till practices, and some use cover crops. Yet there is no significant statistical difference in the amount of snowmelt runoff. The remaining 46% of runoff occurred during the growing season and was the result of overland flow in the form of saturation excess runoff (additional precipitation on an already saturated soil surface) or infiltration excess runoff (rainfall intensity that exceeds infiltration capacity of the soil). Increased infiltration has a limited impact on saturation excess runoff but will decrease the amount of runoff that arises from infiltration excess runoff. How important is each type of non-frozen runoff? A Discovery Farms study from Southwestern Wisconsin examined the role of soil moisture levels on surface runoff during non-frozen soil periods and gives some insight into how much runoff we can expect in saturation or infiltration excess situations*. The study looked at runoff from two different farms with similar soils, landscapes, and climates, but much different management practices. One farm was a no-till corn-soybean operation and the other was a conventional till corn-alfalfa operation. The differences in management practices lead to higher soil organic matter levels and infiltration rates at the no-till farm. About 80% of the non-frozen soil runoff at both farms occurred from saturation excess runoff, when soil moisture levels were already at or near saturation when a precipitation event began. In soil that is not frozen or saturated, the soil health principles that increase infiltration rates will help to reduce the amount of surface runoff. However, most of the runoff in Minnesota and Wisconsin occurs while the soil is frozen or saturated, and increased infiltration rates achieved from an emphasis on soil health principles have a smaller impact. Incorporating these soil health principles where they fit into a farm system can be beneficial for a number of factors, but Discovery Farms data does not show a total reduction of runoff because of increased soil health. The dataset does show, however, that careful management with regard to awareness of weather conditions, nutrient applications and soil conservation measures results in reductions of soil, nitrogen and phosphorus leaving the field with runoff water. Runoff happens, but you can influence what’s in it.